Select the printer and click Next. If the exact model isn’t listed, try the closest model number or a generic printer. I am getting stuck on step 5. I enter the name of my printer as \\10.1.11.43\Color Konica Minolta and get the error "The specified network name is no longer available". The network location comes right out of the printer properties (Ports tab) and is a valid working printer. I have solved the problem by creating a TCP/IP port. Although the steps in the question do work on a generic system, our LAN has group policies preventing named access to a printer in the way specified. Select "Create a New Port" and choose "Standard TCP/IP Port"
Follow the rest of the wizard which gives you the option to set the added printer as the default printer. The local printers will be listed first in the resulting list. Not the answer you're looking for? Browse other questions tagged windows-7 printing printer network-printer or ask your own question. 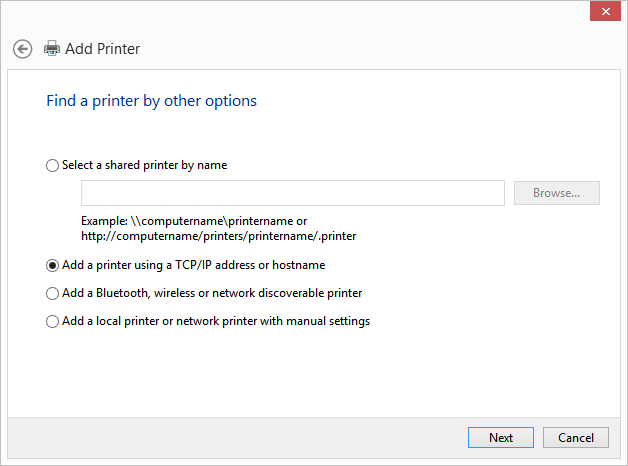 How can I provide a local alternate name for a printer in Windows 7? How can I use network printer while Bitdefender firewall on? How does Windows 10 source drivers for network printers?